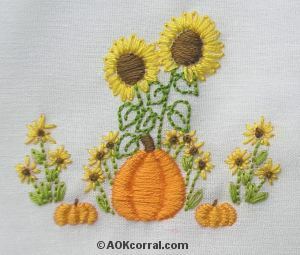 Stitch some simple flower and pumpkin embroidery designs for fall or thanksgiving on your tablecloth or napkins. Before you begin, be sure to wash, and dry your table linens so that any shrinking that may take place in the wash will already be done. Print out the Embroidery Patterns page and separate the two patterns by cutting a circle around each design. Hold the design you wish to use up against a window with the printed side against the window and the back of the pattern facing you. You should be able to see the design through the paper. Using your transfer pencil, trace along all the lines of the design. Heat your iron to the cotton setting. Lay your table linen or other fabric on the ironing board and place the pattern on your desired position with the transfer pencil side against the fabric and the printed side facing you. Press down with your iron for about 20-30 seconds. Do not move the iron, just hold down. Now you are ready to stitch your design. Be sure to use your embroidery hoop and to pull your stitches gently to make sure that your work lays flat when finished and does not pucker. Print out the Key to Stitches & Colors to give you the info you need to stitch the design of your choice. Stitch your design on your fall table linens such as napkins, table runner, doily or table cloth. Great project for adding a handmade touch to your Fall or Thanksgiving Table Settings or how about using the design on a fall pillow case edging or a Battenburg lace doily.